Hadn't fished since last report, after a few continued weeks of a cold, headaches etc. broke down and went to doc for medicine, feeling better. 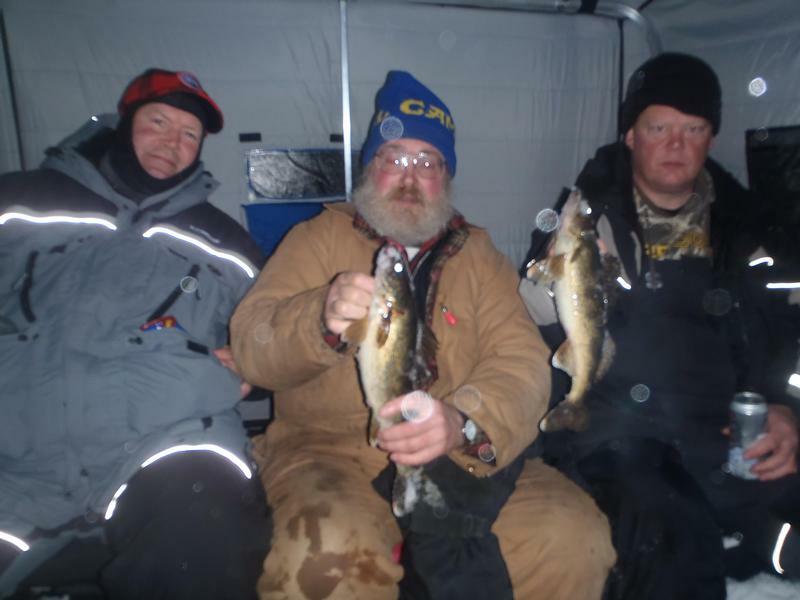 We found a little action on walleye yesterday, went out late afternoon and fished for about an hour after dark, the fish came just before dark. We fished suckers and shiners on tip ups on a big flat in 6-8 fow. On a dark night with the 30mph wind drifting snow and the falling snow coming down sideways, for me the most fun was the snowmobile ride in. Fishing the far reaches of the flowage at night or in a daytime "white out" some people might use other words to describe the experience especially if it goes awry. I suggest people have a compass aboard, lot of fisherman use a gps, a compass is a good idea for back up. I didn't use either but I obviously spend a lot of time out there. In a white out I would have been using a compass. Time of this writing 4-5" of new snow and still coming down, heading out on my once or twice a year trail ride with a group today, should be prime. Another nice weekend ahead in the great northwoods! Fun fishing event this Saturday at Donner's Bay. Hoping someone else can please post some details: time, ticket purchase locations, raffle prizes etc. Thanks!